Zach was able to cover the Ready Player One x Hot Topic Present: The Oasis Experience which is a limited-time only traveling retail experience that pops up in 7 key markets in the weeks leading up to release. Welcome to 2045 will feature exclusive fashion collaborations with Hot Topic, Funko Pop Collectibles and Warner Bros. Consumer Products. Offered on a first-come, first-served basis, the traveling retail experience also features an exclusive first-look at the film and other socially-shareable moments such as exclusive black-light posters, and a museum of holographic artifacts from 2045. The film is set in 2045, with the world on the brink of chaos and collapse. But the people have found salvation in the OASIS, an expansive virtual reality universe created by the brilliant and eccentric James Halliday (Mark Rylance). When Halliday dies, he leaves his immense fortune to the first person to find a digital Easter egg he has hidden somewhere in the OASIS, sparking a contest that grips the entire world. When an unlikely young hero named Wade Watts (Tye Sheridan) joins the contest, he is hurled into a breakneck, reality-bending treasure hunt through a fantastical universe of mystery, discovery and danger. Three-time Oscar winner Spielberg (“Schindler’s List,” “Saving Private Ryan”) directed the film from a screenplay by Zak Penn and Ernest Cline. “Ready Player One” was produced by Donald De Line, Spielberg, Kristie Macosko Krieger and Dan Farah, with Adam Somner, Daniel Lupi, Chris deFaria and Bruce Berman serving as executive producers. 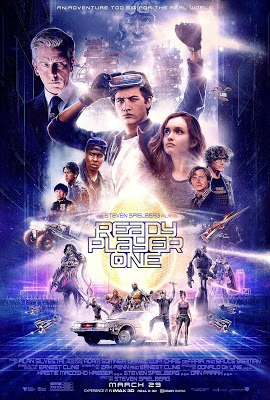 “Ready Player One” stars Tye Sheridan (“X-Men: Apocalypse,” “Mud”), Olivia Cooke (“Me and Earl and the Dying Girl,” “Bates Motel”), Ben Mendelsohn (“Rogue One – A Star Wars Story,” “Bloodline”), Lena Waithe (“Master of None”), T.J. Miller (“Deadpool”), Philip Zhao, Win Morisaki, Hannah John-Kamen (“Star Wars: The Force Awakens”), with Simon Pegg (the “Star Trek” movies, the “Mission: Impossible” movies) and Oscar winner Mark Rylance (“Bridge of Spies,” “Dunkirk”). Opening on Thursday, March 29, 2018, the film will be distributed in 2D and 3D in select theatres and IMAX by Warner Bros. Pictures, a Warner Bros. Entertainment Company, and in select territories by Village Roadshow Pictures. This film has been rated PG-13.